Why not unwind after a couple of days in the frenetic medina? Riad Porte Royale has come to a special arrangement where you can spend a day in the serenity of Jnane Tamsna in the Palmaraie. 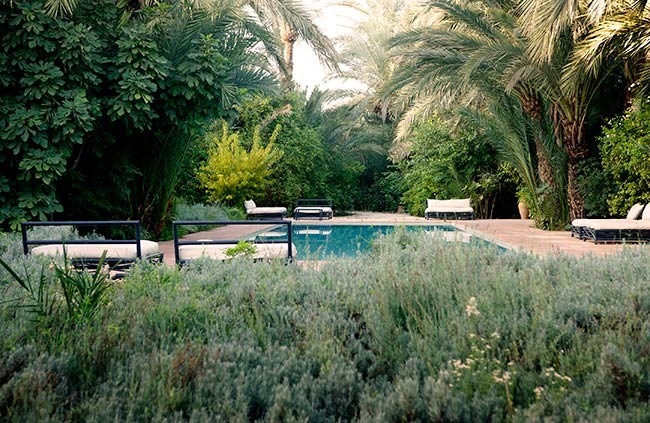 Haunt of the A-list, this is the fabulous home and mystical garden created by Meryanne Loum-Martin, the driving force in Moroccan contemporary design, and her husband Gary Martin, a renowned ethno-botanist and academic. Use of the pools, tennis court (racquets and balls available) and a delicious lunch is included, all guaranteed to give you a taste of opulent Marrakech, the city of contrasts! Cooking Classes can also be arranged. Riad des Palmiers—the perfect partner for Riad Porte Royale in funky Essaouira! Located 180 km west of Marrakech, this picturesque coastal resort offers a welcome escape form the summer heat and bustle of the city. Once know as Mogador this trading and fishing port was largely rebuilt in the 18th century and modelled on St Malo in France. A blend of Portuguese French and berber architecture lend a powerful mystique to the town. With its sandy sweep of beach and blue and white painted houses it has a long association with artists and musicians, and with its strong Atlantic breezes make it popular with kite surfers. In 1952 Orson Welles shot part of his film in the town on its ramparts, there are tales of Jimi Hendrix there during its hippy heyday, and two today it hosts to music festivals annually. Riad des Palmiers offers considerable style and period charm and offers flexible accommodation to suit indiviuslas groups or families up to twelve. Uniquely for Essaouira medina, it not only abuts the city walls with uniteruppted views to the beach and bay, but has a garden with its own palm trees and sizeable plunge pool fed from the roads own private well. We can help put a packaged together and arrange transport to the coats if required—which could include a visit to the nearby Val d?argan estate, the first and only Moroccan vineyard exclusively dedicated to grape varieties from the Rhône Valley.